Whether it’s BYOD, Skype for Business, Office 365 or room systems, we’ll connect you in brilliant HD video. Communication is not just about what is said, but how it’s said, with as much as 93% of the message being non-verbal. Break down distance barriers and improve meeting outcomes with the latest in video conference technology that allows you to communicate as effectively as if you were in the room. Effortlessly see, hear and share with colleagues, partners and clients, no matter where they are. Our new-generation video conferencing systems remove the traditional obstacles of video communication. Gone are complicated connections, frustrating latency and dropped feeds. Instead you get true HD audio and video. These are systems that are easy to use. Smart systems that dynamically adjust to optimise the user experience. You can share and annotate documents in real time. Show multiple participants and documents on the same screen. Have private sideline chats during meetings and moderate meeting comments. With modern video conferencing, you can do all this and so much more. Whether it’s a big conference room, boardroom, small meeting room, huddle puddle or your desktop, we’ll turn your working spaces into centres of collaboration. Bring your own device (BYOD) and connect in seconds. Integrate your existing room systems with Skype for Business and Office 365. Out of the office a lot? Keep your finger on the business pulse with cloud-based mobile video conferencing solutions that turn your tablet or smartphone into an instant meeting venue. As official supplier of all major video conferencing solutions including Lifesize, Polycom, Vidyo, Starleaf and Logitech, we have a video conference solution that is right for you. A solution tailored to your business size and business needs, that can grow as you grow. Whether it’s a meeting of three or a webcast for hundreds, we have the video conferencing solution you need. Modern video conferencing – see, hear, tell, share and get the real message. One of the fastest-growing video conferencing specialists in the world, US-based Lifesize offers cloud-based and on-premise solutions for business big and small. Complete business-class video and audio conferencing solution ideally suited for small meeting rooms. Sized perfectly for huddle rooms and wherever small teams congregate, Lifesize Icon 400 delivers an immersive meeting experience. Ideal for large meeting spaces. Pair it with LifesizeCloud for the ultimate connected experience from conference room, to desktop, to mobile. Established in 1990 with over 400 000 customers worldwide, Polycom’s track record as a quality video conferencing specialist speaks for itself. The ideal solution for small and micro businesses, Polycom Debut brings an enterprise-grade video conferencing solution to smaller rooms and huddle puddles. A group collaboration hub, the ‘Trio’ offers amazing sound, HD content sharing and video interaction. Link multiple personal smart devices (BYOD) to it in seconds. Optimized for smaller groups, the Polycom® RealPresence® Group 300 solution is ideal for small meeting rooms, huddle rooms, and offices. Powerful video collaboration in a sleek design. The Polycom® RealPresence® Group 500 solution is suitable for conference rooms. Suitable for larger meeting rooms, training rooms, classrooms, and other workspaces that have more complex technical requirements. A powerful, enterprise-grade collaboration app that extends video communications beyond the conference room setting to mobile professionals. The Desktop solution for Macs. It combines quality, power and ease-of-use with industry-leading interoperability. The leader in cloud-based VC technology, Vidyo makes true HD video conferencing accessible and affordable for anyone – from big business to the home office. HD-2 delivers 4K ultra HD video resolution. It integrates with room systems, desktops, laptops, tablets, and mobiles via VidyoCloud™ or the on-premise VidyoConferencing™ system. The only collaboration endpoint with support for dual 4K monitors. HD-3 works with room systems, desktops, laptops and smart mobile devices via VidyoCloud™ or on-premise VidyoConferencing™. The VidyoRoom HD-40 delivers outstanding quality and reliability for smaller conference rooms, mobile carts, and shared workspaces. An affordable software group system that delivers ultra HD multi-point video conferencing utilising off-the-shelf computing hardware, cameras and audio devices. The personal videoconferencing solution. VidyoDesktop’s app brings high-quality video conferencing to Windows, Mac, and Linux computers. Logitech bring Swiss precision to its range of HD webcams with built-in noise-cancelling microphones. See and hear in vivid, crystal clear high definition. 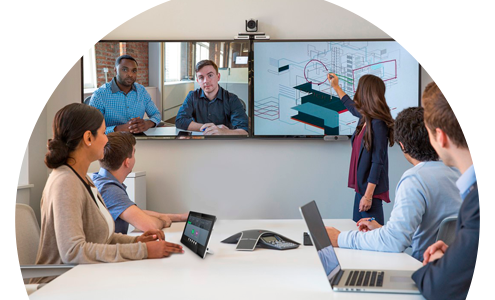 Suitable for mid-sized to large meeting rooms and groups of 14-20, Logitech Group delivers the hardware and software package your business needs for seamless HD collaboration. Full HD 1080p video calling and recording that’s faster, smoother and works on more computers thanks to H.264 encoding. The first ever all-in-one video and audio conferencing device designed with small groups in mind. HD images supported by HD sound. Headquartered in Taiwan, Lumens is a world leader in providing precision optical engineering solutions for classrooms, conference rooms and distance learning. HD 1080p output and 60 fps performance makes the VC-B20U suitable for both lecture capture and video conferencing. Great low-light quality plus a wide range of tilt/pan/zoom actions. Up to 128 preset settings for pan, tilt, zoom, focus, exposure and white balance to allow for more effective and efficient video conferencing. Want the most out of Skype for Business, Lync or Office 365? Starleaf’s new-generation AV solutions will integrate and optimise your current meeting spaces with these leading cloud-based technologies. Purpose-built for Skype for Business, Lync and Office 365, this is a pro-quality, cost-effective integrated meeting room system that just works. Suitable for any sized room, it includes three cameras, two mics and a controller. The Starleaf solution for smaller meeting rooms and huddle spaces. Registering directly with Skype for Business, Lync and Office 365, it’s a compact HD video and audio conferencing endpoint with top-grade features. With a track record of over 40 years, Biamp consistently delivers best-in-class audio hardware and software for pro-grade audio and video conferencing application. Their goal? Making you sound great. Bring your own laptop and create a perfect video conference venue. The Devio conferencing hub integrates with any video conferencing platform, including Microsoft Skype for Business, Vidyo, Polycom and Cisco.